Dad Would Love a Set of PeachSkinSheets for Father’s Day + Giveaway! The Original PeachSkinSheets was founded in 2013 and is based in Atlanta, Georgia. PeachSkinSheets are affordable and breathable thanks to a high performance athletic grade SMART fabric. If you find yourself getting hot with traditional cotton sheets you will love PeachSkinSheets. I am a cold sleeper and my husband is a warm sleeper and these sheets accommodate both of us and the feeling of it on your skin is fabulous, it feels like you have soft, clean sheets out of the dryer everyday. Thanks to this high performance fabric and the soft brushed finish these sheets are comparable to 1500 thread count sheets and do not have problems with piling, shrinkage or wrinkling. Yes I said they are wrinkle free, no more yanking, pulling and stretching the sheets that you just pulled out of the dryer, the wrinkle release is activated in the dryer on medium/high heat setting about 20 minutes after washing. The sheet set in the pic above is on a 12″ mattress and thanks to the deep 18″ pockets they stay put and do not crawl up the corner. PeachSkinSheets are available in a wide variety of colors, we chose Graphite Gray for the set in the pic above, and sizes Split King, Cali King, King, Queen, Full, Twin and XL Dorm Twin and XL Dorm Full. If you are not sure of the exact color you need they offer a free swatch program, pick out your swatches here. Prices start at $79.95 and they always have 2 Colors of the Month priced at $55 for any size set. If you spend $110 or more you get FREE shipping in the contiguous US. Check out the colors of the month here. Dad would love a set of these soft PeachSkinSheets for Father’s Day so be sure to pickup a set for him and go ahead and grab one for yourself. 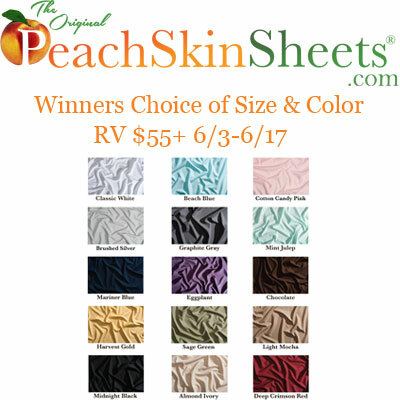 Queen of Reviews has teamed up with PeachSkinSheets to offer a sheet set to one of my lucky readers. Just enter using the Giveaway Tools widget below and be sure to show PeachSkinSheets some love on facebook, twitter, Pinterest & Instagram. Good luck! I had ordered the swatches before, they are very nice. I like all of the colors. Would like to try a brand new color. yes i have ordered the swatches! great colors! I have not ordered one but I think I need to! I order deep Deep Crimson Red. I have ordered swatches in the past and thought the fabric felt lux and strong. Yes, I have ordered swatches in the past from peach skin. I ordered a swatch a couple of days ago. I did not order a swatch because I ordered one last month. No I have not ordered a swatch yet. I didn’t because I already have one. I have ordered the swatches before and I loved all the colors. Yes I have ordered the swatches! Yes, I have ordered a swatch. I have received my swatches multiple times. I love the graphite grey. They would match my room perfectly. I ordered the mariner blue swatch. I would love to get the whole thing. I have previously ordered a swatch. I got the Beach Blue. It’s been a while since I have ordered swatches. I still have them and enjoy rubbing them when I run across them. Hehehe so soft and pretty! I ordered the deep crimson red swatch too. Not yet but will need to look into it. I have ordered the graphite gray and got it previously. I loved the color and material. I wish I could get some of these sheets. Money is tight right now. I have not ordered the swatch, but I probably will! I ordered the swatch for Light Mocha. I have order the eggplant color before. Yes I ordered a swatch…can’t wait to see and feel these sheets! Yes I have and I am amazed at how soft they are. The colors are so beautiful!!! Yes, I love how they feel. Love the gorgeous colors!!!!! I ordered a few swatches several months ago. I love the way the fabric feels. I have marked and will be ordering. I did not order the swatches. I can tell the quality and colors from the pictures. I really like the green colors or tan! These sheets look like they are really soft. I haven’t ordered a swatch, but I would pick from the colors shown on the page.